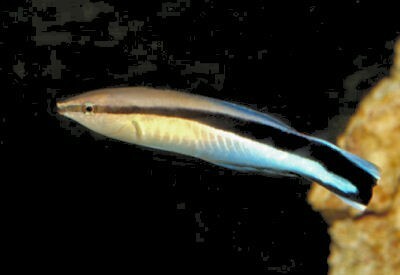 This is the Cleaner Wrasse. It also sets up cleaning stations like the shrimp. Many big fish line up at these to get themselves cleaned. 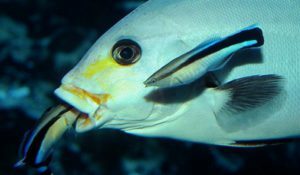 At a cleaning station, different kinds of fish gather quietly, spreading their fins and opening their mouths to get cleaned. At any other place many among them would attack each other. 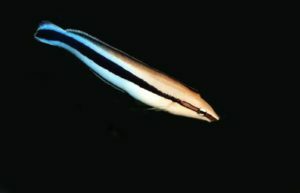 Another type of Cleaner Wrasse called Blue – Streaked Cleaner Wrasse is found in the Indian Ocean. Look at the fish shown below? Doesn’t this look exactly the same as the Blue Streaked Cleaner Wrasse we saw just before? It is a different fish which looks just the same! It is called the Sabre-toothed blenny. 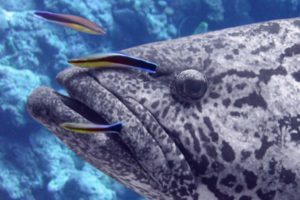 Big fishes confuse it with the Bluestreaked Cleaner Wrasse. It comes near them and pretends to clean them. The moment the big fish gets ready for it, instead of cleaning their scales, they bite at it and run away! 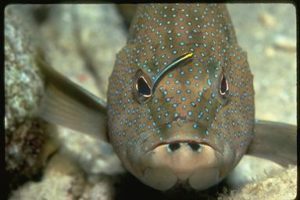 It knows that it looks just like the Cleaner Wrasses and also behaves the way they do, to trick the fish. This is called mimicry, which means acting or looking like any other living being. One last fish, which we will get to know is the Neon Goby, which also cleans big fishes in a similar manner. Many Goby Fishes live together with a kind of shrimp called Pistol Shrimp and they help each other in a very unique way. The next section tells us how.